Does your pet need a place to stay for the night or even for a few weeks? If you do then bring them on in and let us keep your pet! Our Boarding facility is heated/air-conditioned. Our kennels are inside and we have a large pen that we let the dogs out in several times during the day. Each animal is let out by themselves to exercise unless specified by the owner. We are equipped with 13 dog kennels and 7 feline kennels. We do book up fast during the summer and holiday months so if you know your dates that you will be needing please call us and we can get your special friend booked. We do provide everything that your pet will need to stay unless your pet is used to a special item(s). 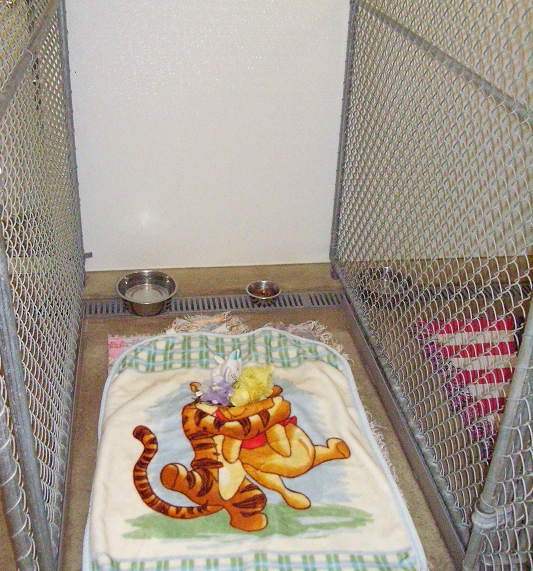 We provide fluffy blankets for your pet to rest on and Eukenuba low residue kennel food. If your pet is used to a certain food type please feel free to bring it with you. Also you may bring any blankets, treats, or toys to make your pet feel more comfortable. Sometimes pets feel more comfortable when they have something they are used to. Also if your pet is on any type of medication please bring it with you! We do ask that if you do bring items with your pet please label it with your pets first and last name. Click to download our Boarding Check-in Sheet! For their protection all boarding animals are required to have current vaccinations. If your pet needs their vaccinations we will be more than happy to give it while they are here staying. If your pet has been vaccinated elsewhere please bring the papers so we can update our files. We do provide you with the option to get your dog bathed before going home. The bath charge is $20.00 for pets staying less than 5 days and $10.00 for pets staying over 5 days. Please understand that this is a bath only. Please remember if you come during the non pickup/drop-off hours you may have a wait while we get your pet ready. and 3:00 p.m. to 4:30 p.m.
*Thurs 9:00 a.m. to 11:30a.m. and 3:00 p.m. to 6:30 p.m.
*Sat 9:30 a.m. to 11:30 a.m.